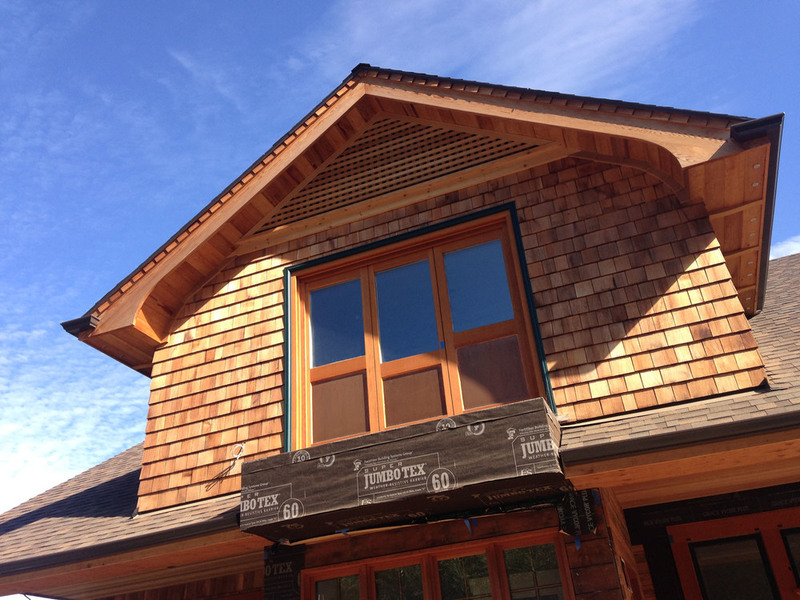 The Corbett-Terwilliger Residence is nearing completion, and was looking beautiful on a sunny day back in October. 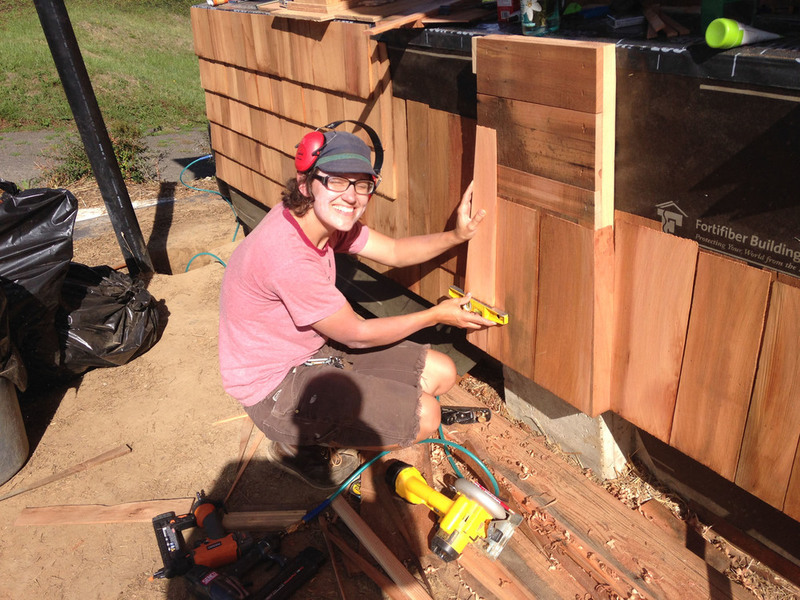 One of our carpenters, Lindsay, was busy installing cedar shingles at the front porch, which is one of the last areas of exterior work. The biggest change since our last update earlier this year is to the interiors, where we have concentrated our work on finish carpentry. The windows and doors throughout the house are cased with fir trim, and the stair hall has custom fir wainscoting. The kitchen cabinets, built by our frequent collaborators Skyline Fine Cabinets, have all been installed. The Corbett-Terwilliger house is coming along nicely. The exterior siding is completed and the crew has moved onto the interior trim. Cabinets are scheduled to be finished any day and the kitchen should be up and running soon. 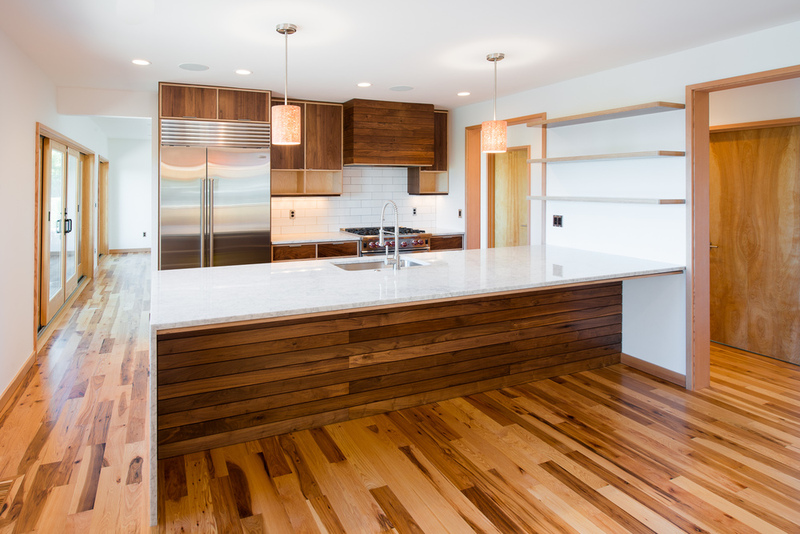 Our Cable Hill House was featured in the annual Homes Tour organized by the AIA Portland chapter. Our largest project of the year was the Skyline Residence. By February, we were done with framing, and the difference in the quality of the spaces was already apparent. Wood floors were installed in March, and by July fabrication of the architectural metalwork was underway. The before and after shots show the marked change in the quality of the spaces. We completed the Fairmount Boulevard kitchen, and documented the journey of the cabinets from a shop in Eugene to installation in Portland. Work continued on the Corbett-Terwilliger house. The form of the house took shape early in the year. Over the course of the year, we worked closely with the client, who built all the windows for the house. 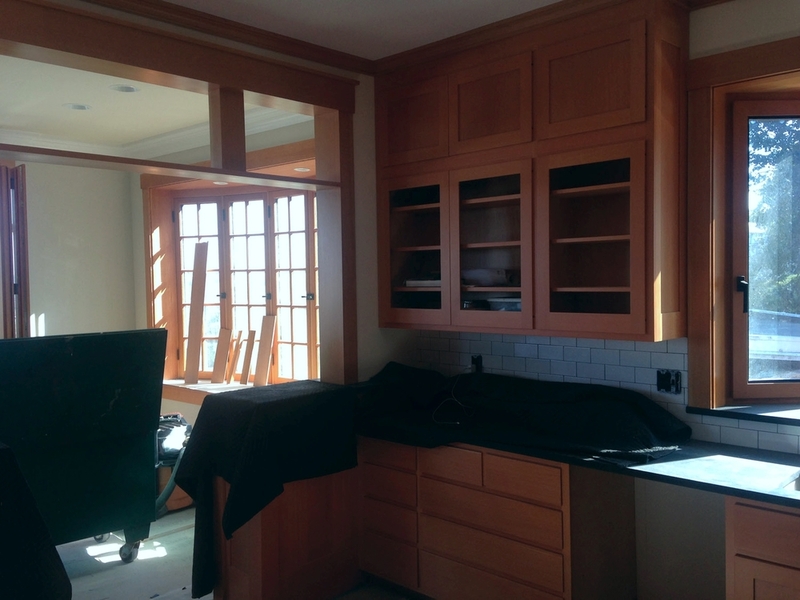 We started work on the Westover Residence kitchen, with the new cabinets delivered in October. We look forward to taking completed photos of the house in the new year. We remodeled a guest suite in a beautiful house located on SW Humphrey Blvd. We launched a new website, which included previously unseen photos of the McShane Studio. We put up new photos of Ryan's old house at 14th Ave, while he continued work on his new house. And the highlight of the year: our annual barbecue, which took place in August. It's a while since we last checked in on the progress at the Corbett-Terwilliger house. 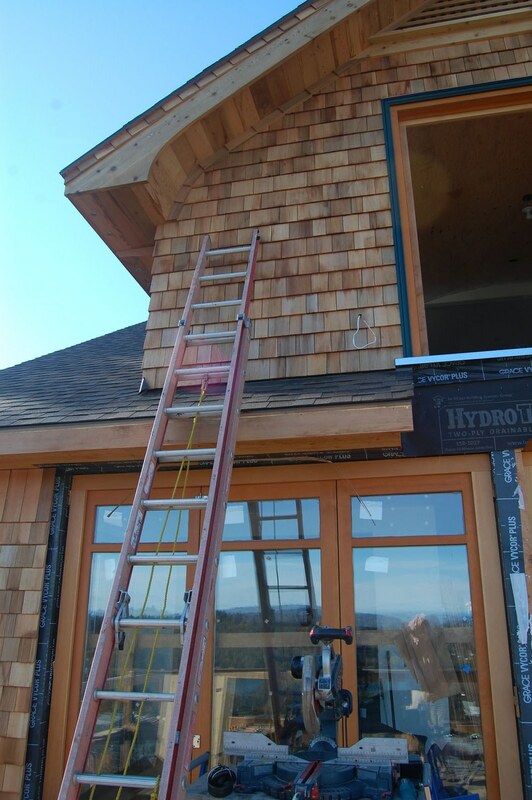 Since then, the majority of the exterior work has been completed, including new custom windows built by the homeowner. The interiors are coming along nicely, and we hope to have a photo update shortly. Since our last post about the Corbett Terwilliger residence, we have completed the roof framing for the building. It's now almost hard to remember what it used to look like. 2012 has flown by for all of us at DRW. We've been working on a number of interesting projects, brought to us by new and repeat clients alike. Thinking back on the year, a lot has happened. We started our blog with some photo galleries, showing both our traditional and modern work. 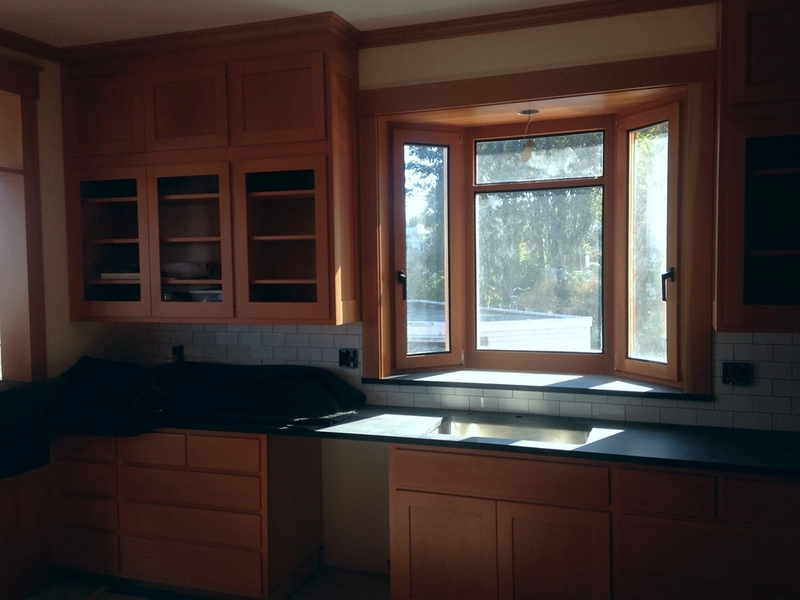 We returned to the Vista House for a kitchen remodel, a house that we always love working in. This nicely complements the work we did there back in 2010. We completed our work on the Cable Hill House. We are especially happy with the interiors of the house, and the exterior lighting. Construction started on the Corbett-Terwilliger remodel. The house had been extensively remodeled before, and our first step was deconstruction of the existing structure. Once we had the had the house stripped to its studs, we could begin re-framing. We completed a mudroom and laundry room on Council Crest. We began work at the Skyline Residence, which we're looking forward to showing more of on our blog as work progresses in 2013. Our friends at Goodlife Brewery have spent a year in an interior we designed for them. Other highlights included: the McShane Studio being featured in Oregon 1859 magazine; doing maintenance work at a wonderful Midcentury house near Forest Park; and completing a couple of modern kitchens. We wish everybody a very happy New Year, and look forward to 2013. For the past couple months at our Corbett-Terwilliger remodel, we have been busy demolishing existing structure, excavating soil, pouring new concrete and reframing walls at the basement and first floor. Now that this work is largely complete, our framers are able to move up to the second floor, and have just started building the walls that will support the roof. It was a rare late-November blue sky day when this photo was taken yesterday, with clear views out across the Willamette, to Mt Hood in the distance. The progress since our last update is most visible from the back of the house, where the addition is being built. And two days later, two of the gables are built. The demolition on our Corbett-Terwilliger project is progressing nicely, and we're now at a stage where we can start adding to the house rather than taking away. We have removed all the exterior siding and interior finishes, and are left with only the basement, first floor joists & wall framing, and second floor joists. Foundations for the new porch at the front of the house. The metal rods are reinforcing bar for the concrete stem wall, which has yet to be poured. The existing front door, still in place. The existing basement will step down three feet here, into a new artists' studio, with a nine foot high ceiling and views out to the river. 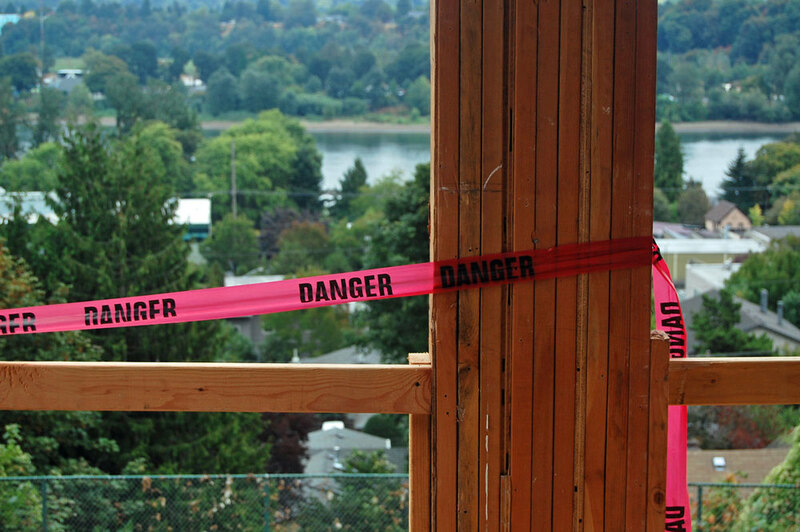 The house sits on a site with incredible views down to the Willamette, which the new house will make the most of. These photos were taken from the location of the future living and dining rooms, which will open out on a large back porch. On a clear day, both Mt Hood and Mt Saint Helens will be visible from the porch. View from the second floor. Demolition has begun on the Corbett-Terwilliger remodel, which we blogged about just after we submitted it for permit. Demolition is a major part of this project, and involves removing the existing roof, siding, exterior deck, insulation, plaster, and interior fixtures, as well as electrical, plumbing and mechanical systems. It's also the first real chance to verify the assumptions about the existing structure that were made during the design process. Once the building is stripped down to studs, we can start with the new concrete work and framing. We hope to start work later this summer, and plan on keeping the blog updated with progress shots during construction.